It seems all little boys I know adore super heroes. Its so cute they want to be super powered and save the world, or at least the world they create in imaginary land! My son has started to like superman, batman and other cape wearing super heroes. He says Whoosh and kicks all around as if he is battling bad guys. Over the summer my sister got a personalized superhero cape for JJ and it was so cute! At the time my son was too little for one but this birthday I thought it would be perfect for him. Finding the right kids capes for me is about the brand. I have seen a few companies that make these types of superhero capes but I wanted one that had a quality that would last my rough and tough toddler. We decided to have a Side Kick size cape made by Power Capes for my son's birthday. They have many colors for the cape, emblem and letter to select from. You can customize it to fit your super kids personality. When the cape arrived I was impressed with the vibrant colors and details. It was very light weight and had a Velcro neck closure that would come apart easily if it was caught on something but enough to stay on while my son was having fun wearing it. He wore it the rest of his birthday party after he opened it. I had to take it off him when he rode his new ride on car toy and he was upset about that! I put it back on him after he was done since he would not let me do anything until I did. I know he will be wearing his cape many places and will soak up all the attention that come with it. He adores people making a fuss over his cool stuff. I think the Power Capes Superhero Capes are perfect for boys and girls as a great gift. They are super cool and cute. They even make adult size ones! I can so see my husband needing one to match our son so my super boys can save the day! He wanted to wear the cape while he rode his new car. He was mad when I took it off of him. If you are planning to shop for a Power Capes you can use the code FRUGAL10TREE to get an additional 10% off - EVEN ON SALE PRICES!! They even take paypal! 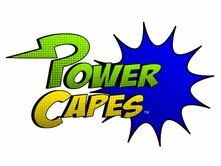 Win a Personalized Side Kick (kid size 22" age 2-7) Power Cape. What Color Cape would you get for your Superhero? I would get a blue one for my son. I follow power capes on twitter as kmayans. I'd get a red one with a yellow lightning bolt! I think my daughter would love the fuschia - probably with a princess crown! I am a facebook fan of Power Capes (Marysa N). I'd get a pink one for my daughter. I posted on PowerCapes Facebook wall that you sent me. I would get a black one, with a red star, with a sparkle "T". Thank you so much for this awesome giveaway. My superhero would love one. I would go with blue, it is my son's favorite color. I would pick the pink cape for my little girl! I follow on GFC. Under SweetMom IAm its not loading for me right now to sign in.